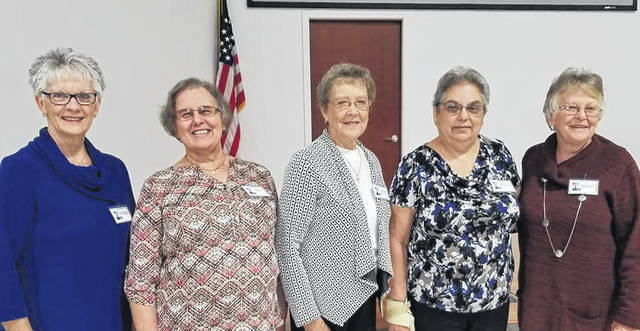 Those pictured are Helen McClain, WVCEOS 2018-19 president, Cynthia Woodworth, 2019-20 Charleston Area representative, Ruth Ann Elkins, Charleston Area CEOS treasurer, Ladonna Darby, 2019-20 Charleston Area assistant representative, and Clinedda Austin, Mason County CEOS president/ current Charleston Area representative and 2019-20 WVCEOS vice president elect. 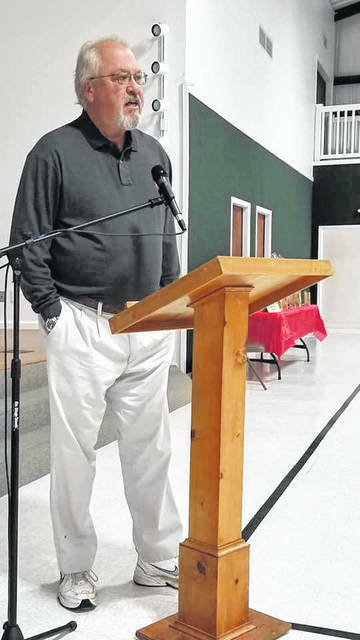 Denny Bellamy spoke about the many historical sites in Mason County as well as the various attractions that are available or are in the planning phase for visitors and residents of Mason County. Jeff Wamsley, of the Mothman Museum in Point Pleasant, shared the mystery portion of the program. He presented information regarding the legend of the “Mothman” and history of the Mothman Museum. The Mason County Community Educational Outreach Service (CEOS) recently hosted the fall meeting of the Charleston Area CEOS on Oct. 13. Clinedda Austin, Mason County CEOS president and Charleston Area representative, welcomed everyone including the 2017-18 WVCEOS President Helen McClain from Lewis County. Following the welcome, pledge of allegiance, etc., the business meeting was held. An announcement was made that Mrs. Austin had been elected as the 2019-20 WVCEOS vice president and would not be serving as Charleston Area CEOS representative for the 2019-20 term. An election was held and Cynthia Woodworth of Cabell County was elected as the 2019-20 Charleston Area representative and Ladonna Darby of Kanawha County was elected to serve as the Charleston Area assistant representative. In keeping with the theme for the day, Mr. Denny Bellamy, director of the Mason County Convention and Visitors Bureau was one of two guest speakers for the day. Mr. Bellamy spoke about the many historical sites in Mason County. He also spoke about the various attractions that are available or are in the planning phase for visitors and residents of Mason County. Prior to lunch, Phyllis Hesson, Mason County CEOS vice president, led the group in singing, “The People of West Virginia” and “West Virginia Hills.” Lunch was then served by the ladies of the First Church of God to those in attendance. Mr. Jeff Wamsley, of the Mothman Museum in Point Pleasant, shared the mystery portion of the program. Mr. Wamsley presented information regarding the legend of the “Mothman” and history of the Mothman Museum. Mrs. Austin then announced that the Charleston Area CEOS spring meeting will be hosted by the Wayne County Community Educational Outreach Service on April 27. The event concluded with drawings for door prizes. https://www.mydailyregister.com/wp-content/uploads/sites/24/2018/10/web1_1031.CEOS_.jpgThose pictured are Helen McClain, WVCEOS 2018-19 president, Cynthia Woodworth, 2019-20 Charleston Area representative, Ruth Ann Elkins, Charleston Area CEOS treasurer, Ladonna Darby, 2019-20 Charleston Area assistant representative, and Clinedda Austin, Mason County CEOS president/ current Charleston Area representative and 2019-20 WVCEOS vice president elect. 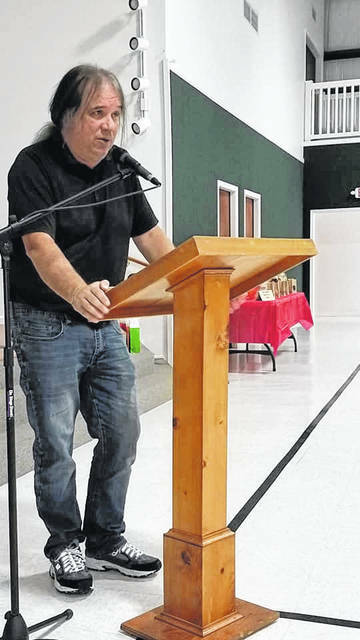 https://www.mydailyregister.com/wp-content/uploads/sites/24/2018/10/web1_1031.CEOS2_.jpgDenny Bellamy spoke about the many historical sites in Mason County as well as the various attractions that are available or are in the planning phase for visitors and residents of Mason County. https://www.mydailyregister.com/wp-content/uploads/sites/24/2018/10/web1_1031.CEOS3_.jpgJeff Wamsley, of the Mothman Museum in Point Pleasant, shared the mystery portion of the program. He presented information regarding the legend of the “Mothman” and history of the Mothman Museum.